Generous farmers dug deep over the summer and donated £2,000 in return for a free moisture meter check. 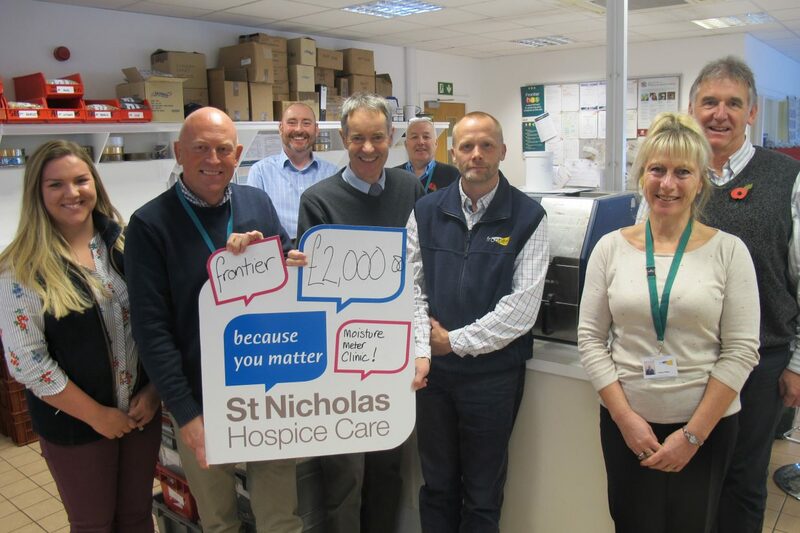 Thanks to the efforts of Frontier Agriculture, Diss, a cheque for £2,000 was handed over to the Hospice. The funds were raised through a moisture meter clinic which saw Frontier invite local farmers to have their moisture meters checked for free in return for a donation to the Hospice. Moisture meters let farmers know when their grain is ready to be harvested by checking moisture levels, during Frontier’s fundraising drive around 85 farmers bought their meters in to be checked. Miranda McCoy, St Nicholas Hospice Care community fundraiser, said: “Thanks so much to Frontier for thinking of us when they invite farmers in for their moisture check and of course a huge thank you to all the farmers that donated.